With baroque, gothic and neoclassical monuments covered in blue-painted ceramic tiles, the red-tiled roofs of port wine warehouses radiating in the sun, and charming yet dilapidated buildings putting their fresh laundry on display – Porto is a grand city of romance. 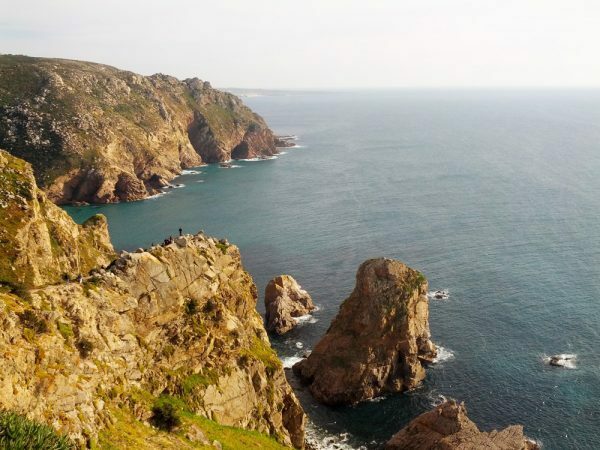 It’s also one of the most affordable destinations in Europe, yet another excuse to visit Portugal’s second largest city. In this 3 days in Porto sample itinerary, we’ll explore the best the city has to offer both on the sightseeing and culinary fronts. We combined a November couple’s trip to Porto together with a visit to Lisbon, with Porto being a place we wanted to pay a visit to for a very long time. 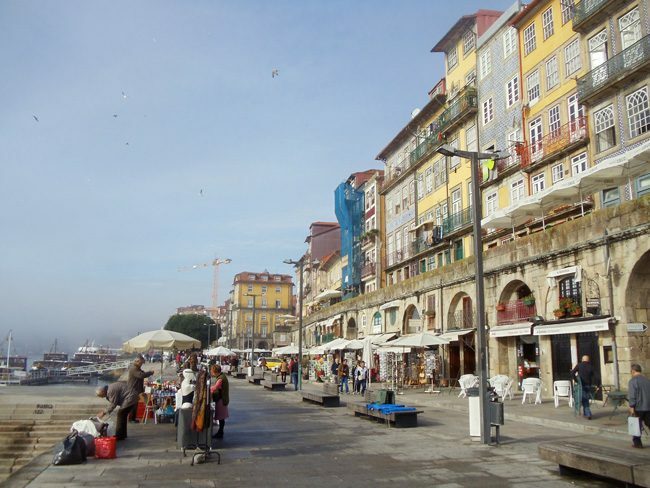 Located not too far from the mouth of the Douro River, Porto was a strategic port city for centuries and responsible for the export of the sweet-tasting port wine. Unlike Lisbon, both banks of the river are interesting to explore and the iconic Dom Luis I Bridge makes it possible to cross the otherwise choppy waters of the river. 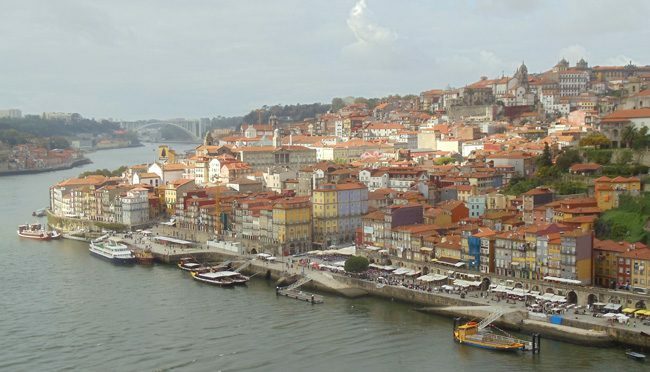 Porto’s historic city center, where you’ll spend the bulk of your time, was named a UNESCO World Heritage Site in 1996. 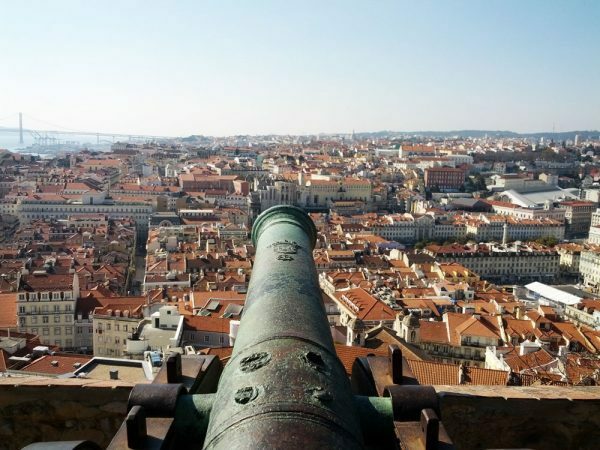 What’s Included in this 3 days in Porto Sample Itinerary? 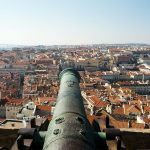 Visiting Lisbon or other parts of Portugal? 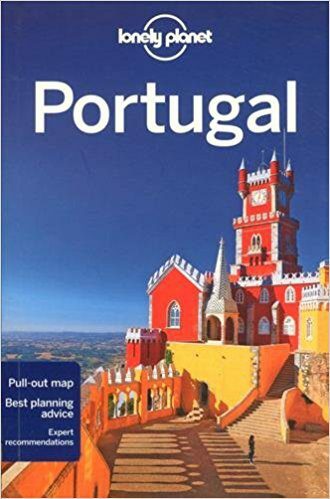 Sample Portugal itineraries and an in-depth guide to Portugal’s capital city are waiting for you in the Portugal Travel Guide collection. Bom dia! To extend your visit to this part of Portugal, consider visiting the Douro Valley wine region on a day trip from Porto. 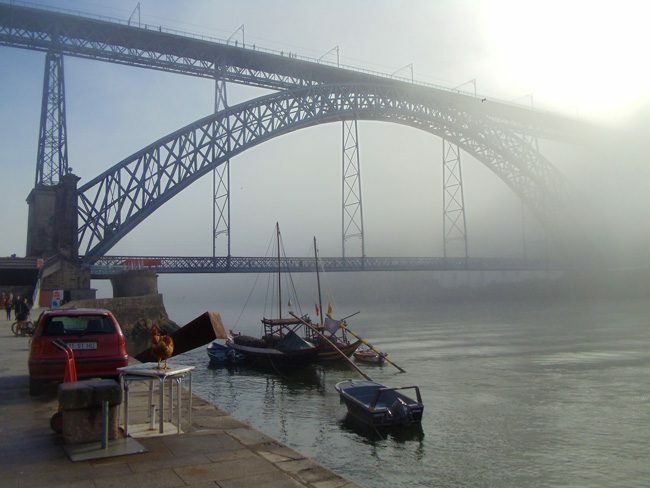 You can do this by renting a car for the day or by joining a riverboat tour from Porto. Be prepared to check in at least one suitcase when returning home from Portugal. What’s the reason? 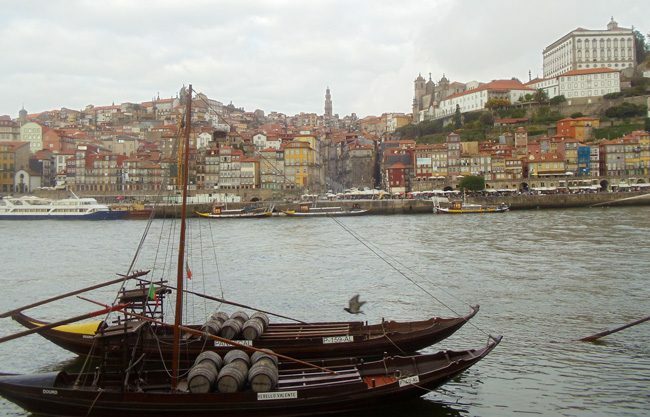 You’ll want to bring home a few bottles of port wine, Porto’s famous export. 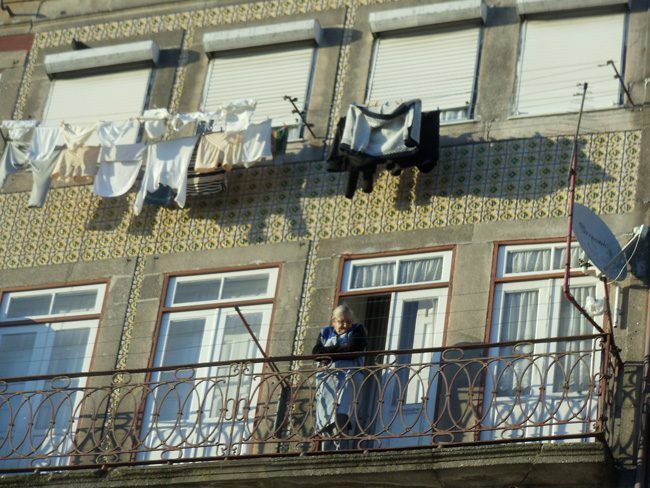 Many of Porto’s residents struggle to make ends meet, resulting in petty crime throughout the city. While violent crime is not a concern for visitors, be conscious of pickpockets in crowded areas and book a room which has a safe to lock your valuables inside. We had the unpleasant experience of having many items stolen from our hotel room in a “sting operation” where thieves posed as guests while rooms were being cleaned. 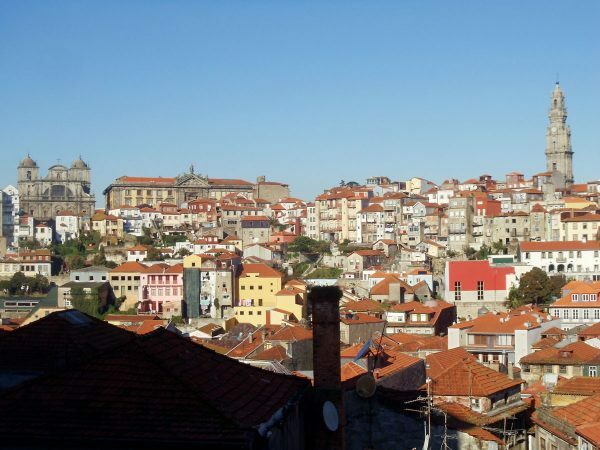 Despite its many hills, Porto is a city that is best explored on foot. 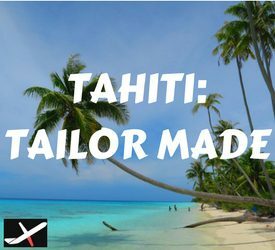 Be sure to pack comfortable shoes and have a look at the X Days In Y Packing List for clothing and apparel ideas. If you struggle with hills, plan your day so that it starts at the highest elevation and work your way down to the flat river bank. When dining in restaurants, you’ll almost always be served a few delicious appetizers right after you’re shown to your table (olives, bread, and dumplings). These aren’t free and you’ll usually be charged 1€ per consumed item. 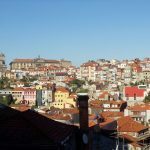 How to Get to Porto from Lisbon by Train? If you’re combining your trip to Porto with a visit to Lisbon, you don’t need to rent a car or take the plane. We took an afternoon train from Lisbon’s Santa Apolonia Station and arrived at Porto’s Campana Station outside the historic center. From there, we quite easily caught a connecting train to Sao Bento Station at the heart of the historic city center. Take note of two train options: a fast line and a “regular train”. The difference between the two is around 10€ per person and 30 minutes. 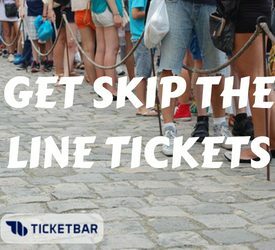 Check cp.pt for rail times and prices. 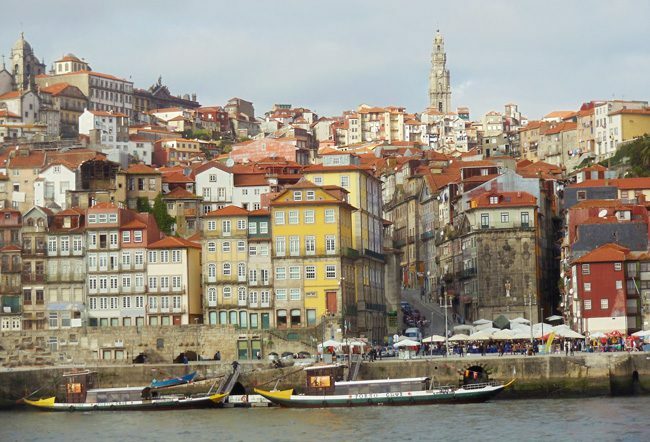 I recommend basing yourself in the Ribeira district – Porto’s historic riverfront neighborhood. There’s a good selection of accommodations around here as well dining and drinking options. The port houses of Vila Nova de Gaia are just a short walk across the iron Dom Luís I Bridge and the city-center hills are a stone’s throw away. Another plus to sleeping in Ribeira is that you’ll be walking downhill after a long day of sightseeing. 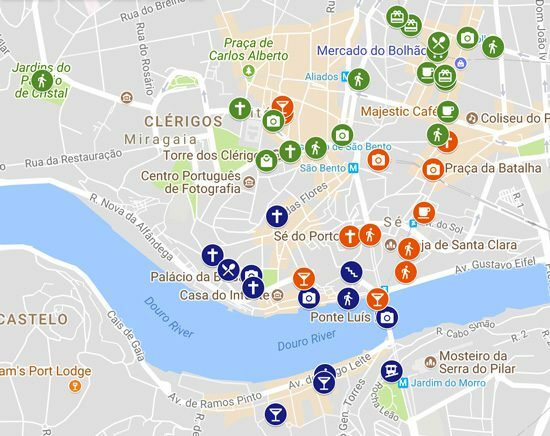 Here’s a list of Porto accommodations that you can book online! 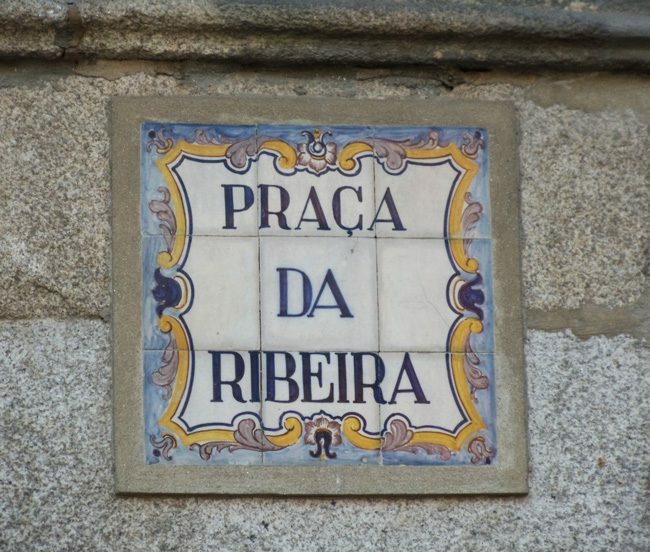 We’ll spend the first of our 3 days in Porto in the historic Ribeira district, later crossing to the opposite bank of the River Douro to sample some port wine in the Vila Nova de Gaia neighborhood. We’ll come back here a little later on to cross to the other side of the river, but I nonetheless recommend to start your day here with breakfast by the river. The riverside Cais da Ribeira and its main gathering spot – Praça Ribeira – are among the most picturesque spots in Porto, especially with morning fog partially covering the Dom Luis I Bridge. Grab a seat at the outdoor terrace of the cafe of your choice and enjoy watching the neighborhood’s mostly senior residents starting their day. Take note of the charming houses, whose facades are covered with colorful tiles (azulejos) and laundry drying in the sun. This entire area is a UNESCO World Heritage Site. 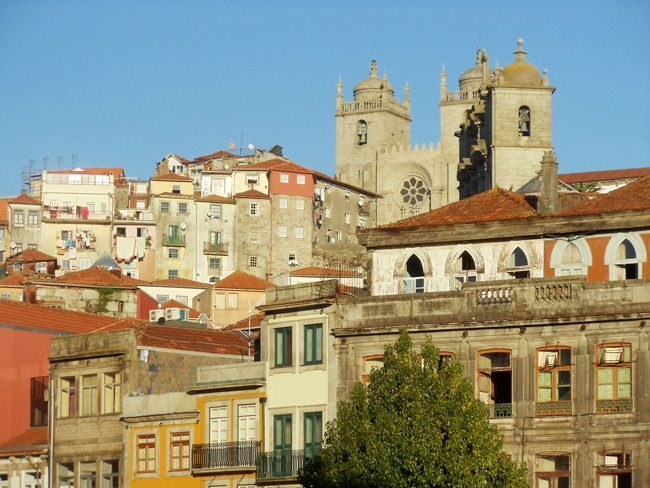 Start the sightseeing portion of this first day at this 16th-century church and the highest elevated spot we’ll walk to on this side of the River Douro. The church’s Italian-influenced facade is quite impressive but if you fancy art, pay the symbolic admission price to experience its interior and to see its famous resident painting dating back to the Renaissance Era. 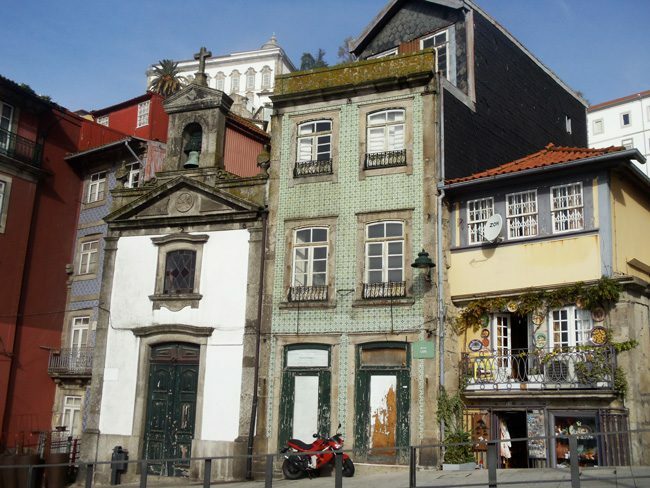 Make your way to the first real stop of the day – Palacio da Bolsa – via the narrow streets of the Ribeira. These cobblestone lanes are crowded with old residential buildings, small squares, and lots of charm. 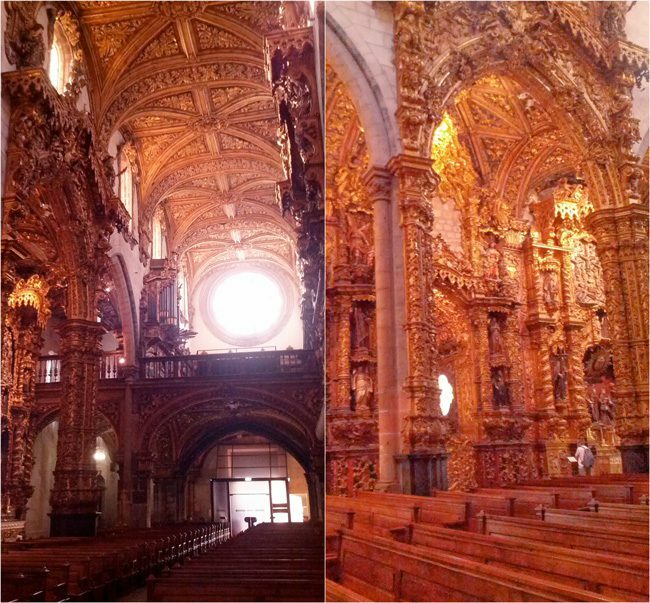 Though not a must, feel free to check out the Church of Sao Joao Novo – a pretty 16th-century cathedral. Porto’s former stock exchange is among the city’s most magnificent buildings. Built in neoclassical style, the 19th-century palace was constructed to honor the city’s bankers and financiers. While the palace looks impressive from the exterior, it’s what lies inside that will blow you away but you’ll need to join a guided tour (~6€). 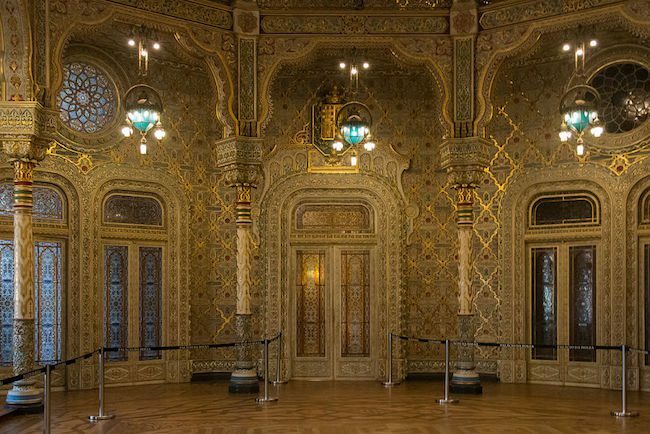 The absolute highlight is the Arabian Hall – a grand Moorish-influenced ballroom whose walls are decorated with gold. Guided tours run for about 30 minutes but it’s worth to check the seasonal opening times. The Igreja de Sao Francisco resembles other gothic-influenced churches you come across in the city. The twist, however, is its interior chapel – one of the most impressive I’ve ever seen. Tickets cost ~3.50€ per person but take note that photography of any kind is not allowed inside (at least not when we visited). Therefore, I had to “risk it” and snap a few covert photos to share with you the magic of this place. Inside the church, there’s a small museum housing impressive religious artifacts and a crypt. 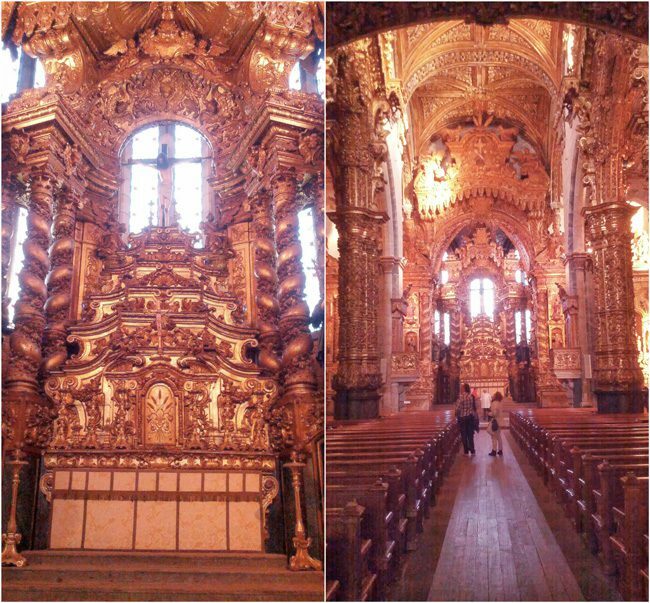 However, the jewel in the crown is the chapel – an unfathomable accomplishment of Baroque-style woodwork covered with kilograms of gold. This is simply an amazing sight which you do not want to miss! It’s back to riverfront Cais da Ribeira, where you can grab a cup of coffee or a drink with a side of tapas at the trendy Bar Ponte Pensil. 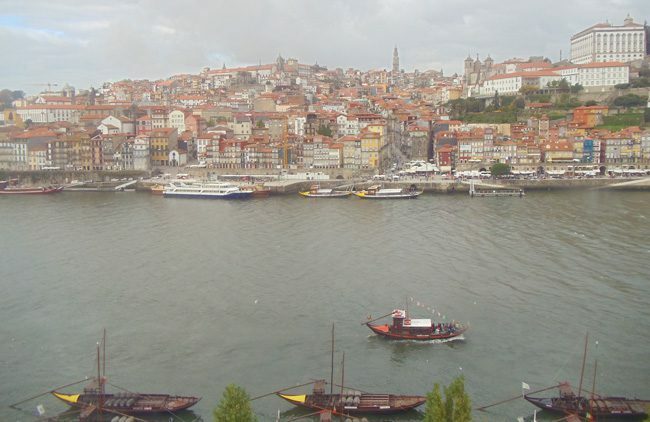 We’ll return to this side of town from the lower deck of the Dom Luis I Bridge but to get across to the Vila Nova de Gaia district (Gaia), take the steps from the Ribeira (see map) to the more scenic and pedestrian-friendly upper deck of the bridge. The famous bridge was completed in 1866 by a student of Eiffel, solving a major traffic challenge that plagued the city’s expansion at the time. Together with the backdrop of the tiled-facades of the Cais da Ribeira – this is Porto’s most iconic photo spot. Once on the other bank of the river, you can visit the Mosteiro da Serra de Pilar – a former church that’s now a military. 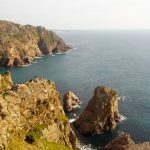 But from up here, you basically need to head down to the riverbank Avenida de Diogo Leite either by foot or via the scenic way – the 63-meter high cable car. The five-minute ride costs 6€ (a one-way ticket is enough) and whisks you 600 meters down to the riverbank. The views on the ride are totally worth the price of admission and your ticket should include a voucher for free port wine tasting at one of the participating wineries. Pro tip: Here’s a little background on port wine and types of bottles you can bring back home with you (highly recommended). 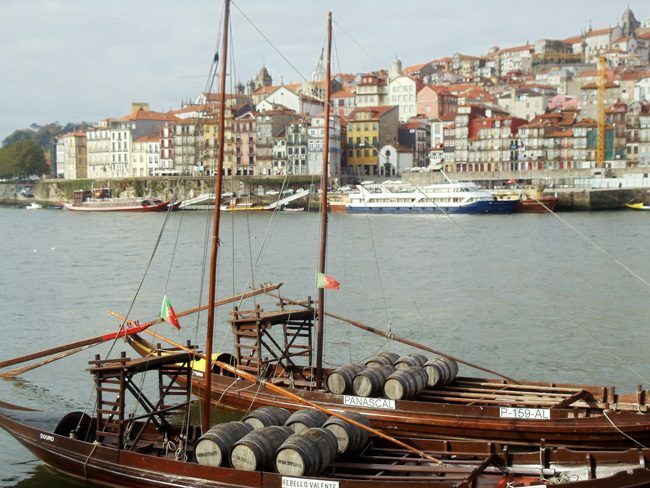 Vila Nova de Gaia (a.k.a Gaia) is the world’s port wine capital – the sweet-tasting wine that once fueled the city’s coffers like oil in Arabia. The grapes themselves are grown in the Douro Valley, where they are turned into wine and shipped downstream for aging in the warehouses of Vila Nova de Gaia. Among the legendary brand names are Taylor’s and Graham’s – not exactly Portuguese-sounding. You see, it is the British who are credited with commercializing the production of port wine, rising out of their need for an alternative to French wine back when the two former superpowers were at war. Port wine (red, white or rose) can only be made from grapes growing the Douro Valley – kind of like champagne. With very hot summers and cold winters, grapes grow in very harsh and rocky conditions, forcing the vines to dig deep into the ground to find nourishment. Once harvested, they are crushed (still mostly by feet) and almost immediately added to a blend of brandy. The brandy’s high alcohol content stops the fermentation process and preserves the sweet taste of the grapes. Port wine goes great with light food such as nuts, cheese, and fruit – making it an ideal dessert wine. Ruby: the simplest port wine, made from average grapes and aged in large, usually metal tanks for at least two years before bottling. It tastes very sweet and fruity, with bottles going for as little as 10€. Tawny: port wine that’s made from a blend of grapes and aged in wooden barrels for up to 40 years. It is very aromatic with wooden flavors and offers excellent value for money (15-20€) especially if you buy the aged tawnies. Here’s an important tip: tawny port can be stored in an upright position. Vintage: a rare type of port that’s produced only from the best grapes of exceptional harvests (typically a few times every decade). The wine is aged for two years in the hopes of qualifying for vintage status upon inspection by experts, after which it is bottled long before it’s ready to be consumed. Unlike other ports, vintage is not filtered when bottled and since you don’t want to have sediment at the bottom of the bottle, the wine is aged for ten additional years lying flat. Vintage port has very heavy aromas and deep complex taste. It must be consumed at the time of opening so only appropriate for special occasions (like champagne). Prices start at around 50€ and up to the hundreds the older you get. Late Bottled Vintage (LBV): made from the best grapes of a single year then aged in wooden caskets for a 4-6 years before being bottled (that’s why it’s called “late bottled”). LBV is fruity with a very smooth texture and can only be kept for two years once bottled so always look at the bottling date before buying. Once opened, it must be consumed within less than a year. LBV starts at around 20€, making it very affordable for such excellent quality. 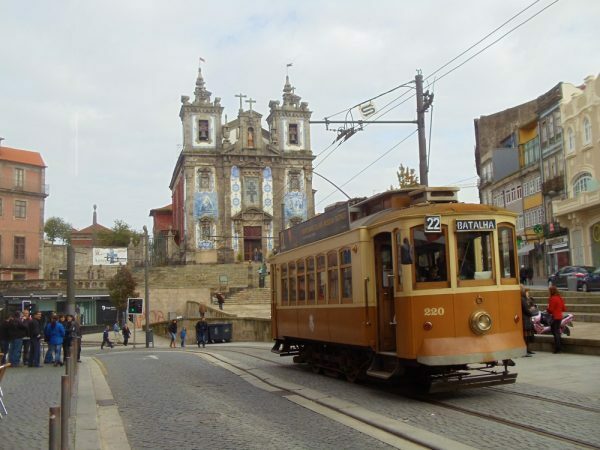 Once you disembark the cable car you’re right on Avenida de Diogo Leite – the riverfront promenade of the Gaia. Have a look at the classic rabelo boats – a Porto signature. 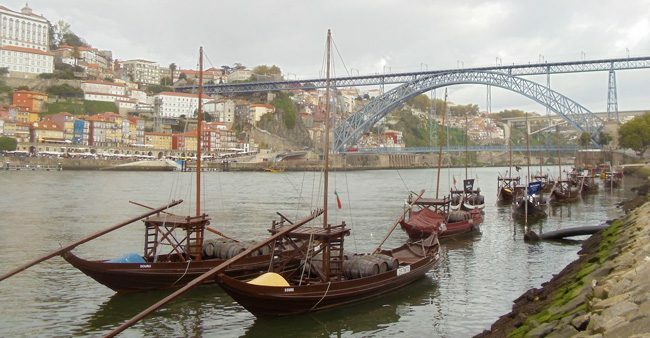 Nowadays replaced by trucks, these specially-designed boats were used to transport barrels of port wine to be aged in the warehouses of the Gaia. Every year, the district’s wineries take a break from competing over the pallets of drinkers and instead race these boats in celebration of old times. The charming pedestrian avenue is a place you’ll want to hang around for a while. 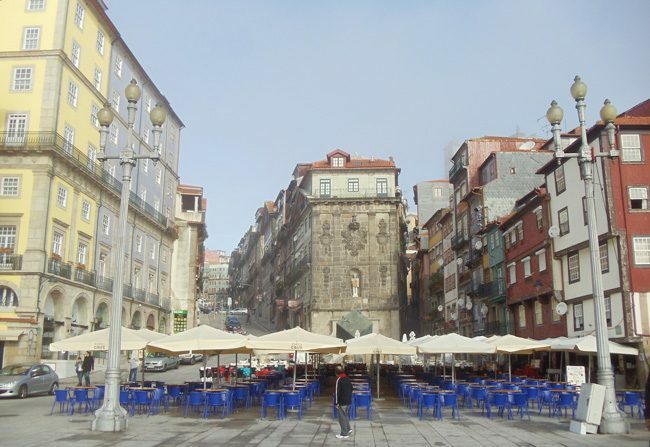 The view across the river to the Ribeira backed by the upper sections of the old city center is sublime and you can have lunch with a side or port wine, do some souvenir shopping and buy a bag of hot chestnuts in winter months. Most of the Gaia’s port houses and wineries used to offer free tours which also included a tasting. 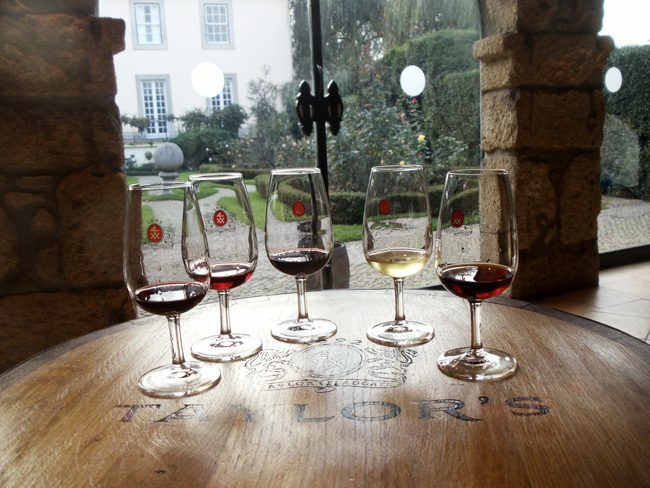 These days, you’ll usually need to pay 5-7€ for either a tasting or a tour plus a tasting – still a pretty good deal considering you get to taste four different port wines. 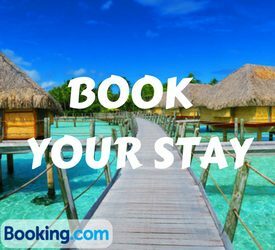 There are a dozen or so places that you can visit so choosing the best ones is key unless you really want to get drunk. I recommend visiting a maximum of 2-3 wineries, with Taylor’s being the port winery that you don’t want to miss! 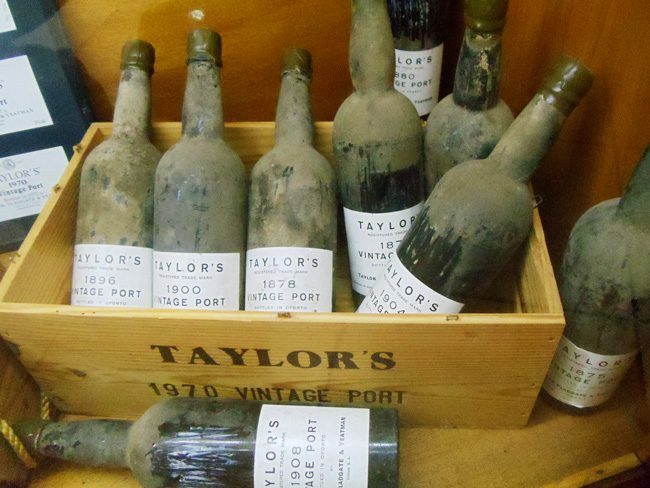 Producing port wine since 1692, Taylor’s is among the finest makers of port. 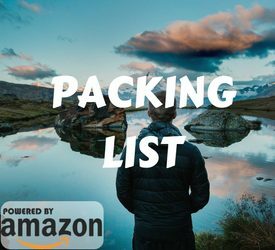 Their warehouse is located a pleasant 10-minute walk up a hill overlooking the Gaia and Riberia, away from the hustle and bustle of the riverfront. The visitor’s center is more like a museum and you’ll love walking around as you learn about the history behind the famous brand. 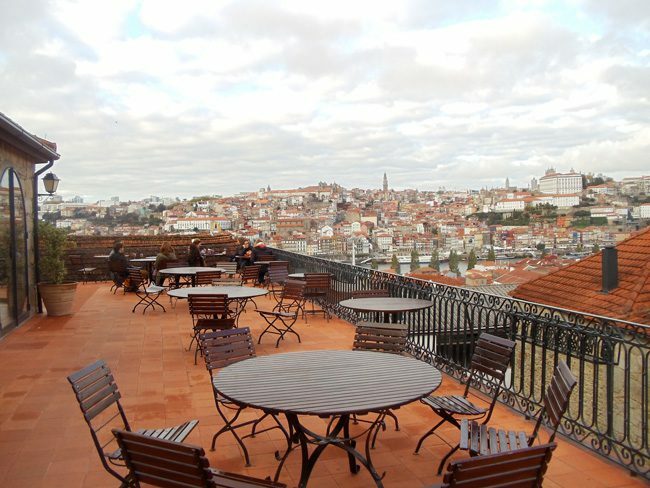 There’s also a highly acclaimed restaurant on the premises with a terrace overlooking the historic city center of Porto. Tours and tasting cost 12€ per person, not exactly cheap but really worth it. 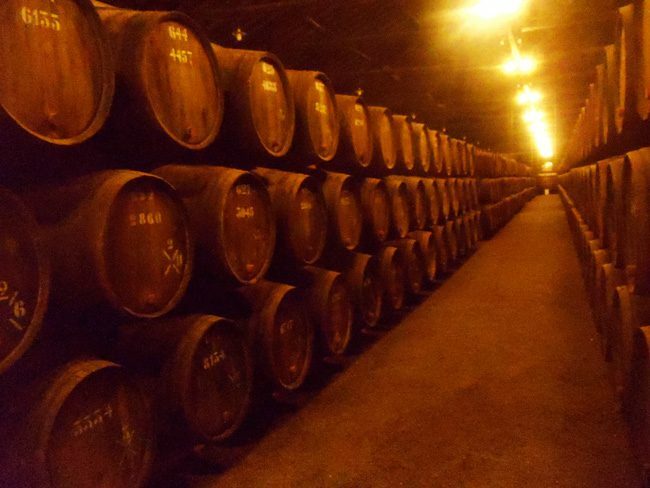 The tour takes you around the large property, including a visit to the cellars where thousands of barrels are slowly aging. You’ll wrap things up with a very generous tasting of four port wines and you can (of course) pick up a few bottles from the gift shop. 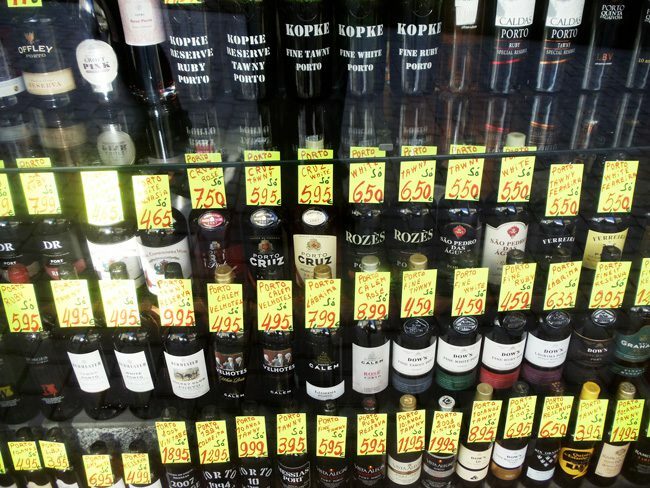 Pro tip: note that buying bottles of port wine at the source isn’t necessarily cheaper than buying in specialty shops in town. In fact, we discovered a price difference of up to 30%! You’ll likely feel slightly tipsy after visiting a couple of wineries so heading back to the hotel in preparation for dinner is a good idea. 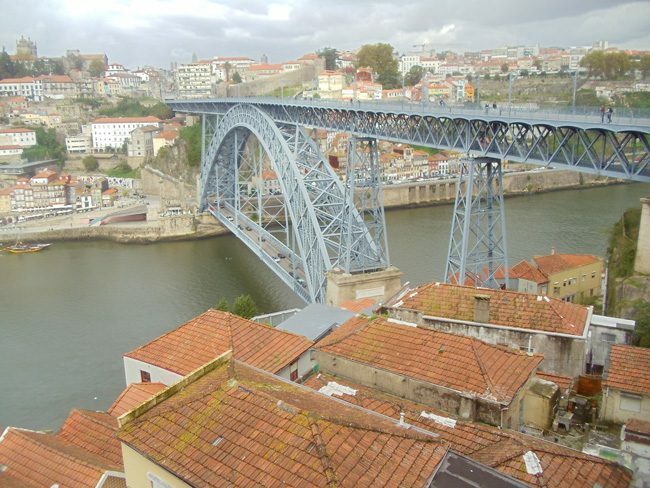 If staying in the Ribeira, simply take the lower deck of the bridge. For an authentic dining experience in Porto, head to O Bom Talher on Rua Comércio. This is a family-owned restaurant recommended to us by a local friend. The atmosphere is not touristy at all and the menu is very modest despite the close proximity to the large eateries of the Ribeira. We went for the grilled cod fish – a Porto specialty. It can be ordered either as a ½ portion or a full one but whatever the case may be – you won’t leave this place hungry! For a main dish, wine plus desserts, we paid under 30€ for the both of us and it seemed as though the entire family was on hand to make us feel welcomed.